Greg Biffle snapped a 64 race winless streak at today’s Sunoco Red Cross Pennsylvania 500 at Pocono Speedway with a decision to take two tires after a 30 minute red flag after a heart dropping crash involving Elliott Sadler and Kurt Busch. The start of the race today was delayed due to rain with the drop of the green flag at 1:54pm ET. Tony Stewart led the first lap with Jeff Gordon taking over the lead on lap 3. After a pit stop during a competition yellow was called at lap 16, Jeff Gordon led the field to the green flag followed by Greg Biffle, Jimmie Johnson, Matt Kenseth and Juan Pablo Montoya. On lap 22 Jimmie Johnson took over the lead and held that position until lap 120 when Jeff Gordon passes him on the Long Pond Straight. On lap 121 a yellow flag was thrown for debris on the track which put Greg Biffle in the lead after a two tire stop. The scariest moment in the day came on lap 164 when Kurt Busch was tapped my Jimmie Johnson which sent him up the track into Clint Bowyer, then into the outside wall and across the track into the inside wall. However the scary moment was when Elliott Sadler was hit from behind when trying to avoid the mess in front him and hit head on into a a guard rail on this inside of the race track in turn 2. The impact was so severe that it knocked the engine out of car. Sadler struggled to get out of the car, but did so on his own, then laid on his back on the ground next to his race car. 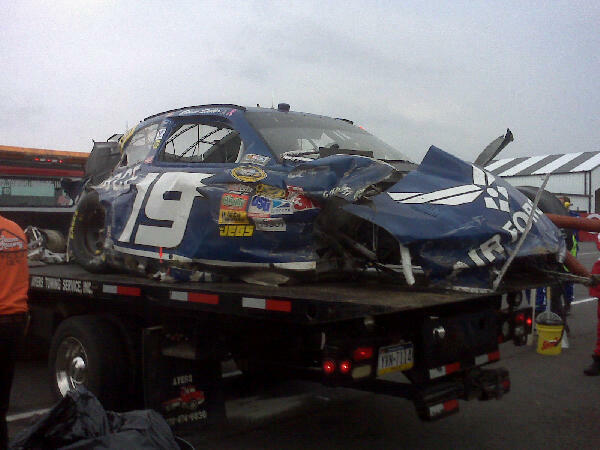 Kurt Busch stated that “Jimmie Johnson drove straight through us” after he excited the infield care center. 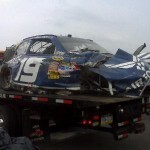 During the red flag for this incident, the ESPN commentators stated that Pocono was scheduled to have safer barriers installed on all the inside walls of the track after this season. However, I do have to state that I am very disapointed that this has not already been done. It’s been 9 years since Dale Earnhardt died which I would think is ample time for the safer barrier work to be completed on ALL the walls. NASCAR has got to demand that all race tracks have 100% of their walls as safer barriers and any wall that is unsafe needs to be repaired. This is for the safetly of the drivers and there is little excuse not to demand these features. Thank god for the Hans Device or we may have been looking at a more dire situation. After the engines were fired after the red flag, came the dreaded crew chief decision..two tires or four. Sam Hornish Jr did not pit at all, Greg Biffle, Tony Stewart and others opted for two tires, while Jeff Gordon and Jimmie Johnson opted for four. Another delay came before the green flag could drop for rain. After 15 minutes under red, engines were fired. With 21 laps to go, Greg Biffle took over the lead and put a 5 second cushion between him and second place. Biffle came to the checkered flag first announcing on the radio “This is for Jack!” Tony Stewart crossed the line in 2nd followed by Carl Edwards, Kevin Harvick, Denny Hamlin and Jeff Gordon. We know he’s watching,” (Jack Roush) Biffle said. “It’s been really tough. We worked so hard.” “We know we have a great team and I know I can do it behind the wheel and we were able to prove it (Sunday),” Biffle said. Biffle has been struggling but this gives his team a confidence boost and is probably the best medicine for Jack Roush’s healing process. Biffle even joked that he may not remember what to do in victory lane. Good blog! I actually love how it is easy on my eyes as well as the information are well written. I am wondering how I might be notified whenever a new post has been made. I have subscribed to your rss feed which should do the trick! Have a nice day! I am so glad you are enjoying it and Thanks for stopping by. Along with the RSS feed, I also have a twitter account that I notify every time I update my blog. I don’t know if you are on twitter, but you can view my page without having an account by going to http://twitter.com/trackdebris. Again, Thanks for stopping by!! Thanks for stopping by and glad you are enjoying it!! Auto-Spooning: Should there be a rules change? If Dale were here today….